A VERY FINE REVOLUTIONARY WAR PERIOD AMERICAN-MADE OFFICER’S “COMMITTEE OF SAFETY” FUSIL/MUSKET (ATRIBUTABLE to ASA WATERS of MILBURY, MASS. ), ca. 1777. 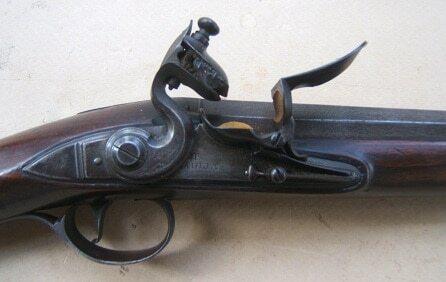 In very fine original flintlock condition. Octagonal-to-round, pin-fastened, 40 3/4″, smoothbore, .69 caliber, proof-marked barrel with a bottom mounted bayonet-lug, a fine wedding-band transition and a brass front sight: the left side of the breech with “PRO” & “VED” proof-marks within “sausage-shaped” borders, of the type used by Asa Waters of Milbury, Mass 1742-1813 (Please see: E. Heer’s: “Der Neue Stockel”, vol. 2, pg. 1354 & Merrill Lindsay’s: “The New England Gun”, pg. 32). Nicely carved and molded, hardwood (Cherry?) 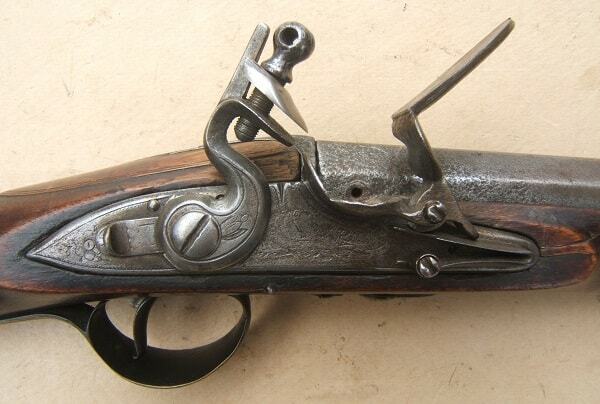 fullstock of Brown Bess-inspired design, having simple raised carved points, around the lock and sideplate mortises, a raised beavertail apron at the barrel-tang and a pronounced lobe at the tailpipe. Accented with incised carved double-thread lines, along the forestock and around the border of the beavertail-apron. The semi-Roman-Nose buttstock with a deeply fluted and raised comb of classic American Revolutionary War Period form. American sheet-brass and engraved English-style furniture. The buttplate with a finely etched stepped tang, (4) barrel-form ramrod pipes, a sheet-brass, rifle-type/triangular sideplate and a pin-fastened nose-cap. The trigger-guard with an embossed acorn forward finial and its bow with finely etched floral scrolls, en suite with the buttplate-tang. Lightly engraved, unmarked, American-made? lock with flat surfaces, a bridled powder-pan, a sliding rear safety and its matching gooseneck hammer: the top-jaw associated. 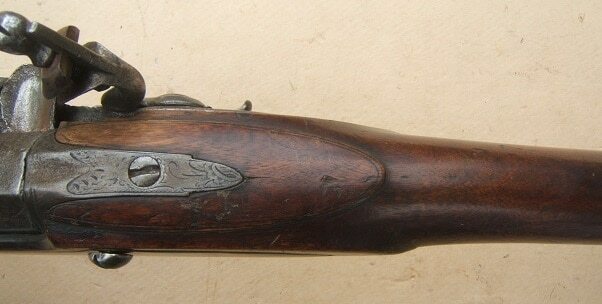 In overall very fine untouched original flintlock condition. 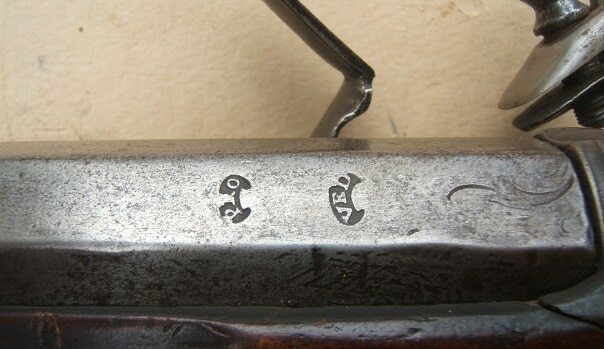 The iron surfaces of the barrel with a smooth steel-gray age patina and the expected light scattered discoloration/fine pitting, at the hooked-breech and touch hole. The lock with matching smooth surfaces and is in mechanically functional order with a strong mainspring and fine timing. Very Fine stock with 85%+ finish, sharp contours, some light handling marks and minor abrasions/tight hairlines. The brass furniture with a fine, untouched, mustard-toned patina and sharp engraving. 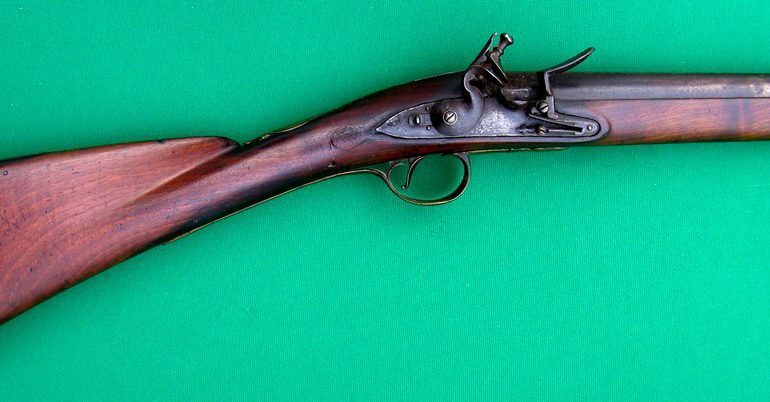 A very nice example of an attributable, American, Revolutionary War Period, Officer’s Fusil/Musket, made by a noted Colonial Massachusetts gunsmith. Complete with its button-head iron ramrod. Overall length, 57″.